High housing costs help generate a 5.8% jump in consumer prices to top even Miami and L.A.
High housing and transportation costs caused Honolulu's consumer price index to jump 5.8 percent in the first half of 2006 compared with the same period last year -- the biggest increase of any U.S. city, according to a report yesterday from the federal Bureau of Labor Statistics. The average inflation rate for all U.S. cities and the U.S. West was 3.8 percent during the first half of 2006. Nationwide, only two other areas had inflation above 5 percent, said Charlotte Yee, regional economist for the Bureau of Labor Statistics. These cities, which also have strong housing markets, were Miami at 5.7 percent inflation and Los Angeles at 5.1 percent, she said. While Honolulu's high inflation is a sign that the economy is booming, the rapid rise has the potential to strain local budgets, since wages have not kept pace with prices, state economist Pearl Imada Iboshi said. "Wow. These numbers are higher than we expected," Imada Iboshi said. "In practical terms it means our money is not going to go as far as it used to. If we are spending more money on housing and transportation, we have less to spend on other things." Other economists have said that Honolulu's growing inflation is also symptomatic of strained capacity constraints and could exacerbate the state's already tight labor market, transportation and housing woes. News of Honolulu's high inflation is not going to make recruiting workers to fill slots in a tight labor market any easier, said Judy Bishop, president of Bishop and Co., a local staffing company. As the spread between wages and inflation widens and it becomes more difficult to attract and keep workers, sustaining economic expansion becomes challenging, she said. "If we want to continue to attract people to come to Hawaii and work, we'll have to look at implementing creative solutions for housing and transportation costs," Bishop said. Honolulu's latest wage census recorded an annual average wage gain of 2.8 percent from 2004 to 2005, which is well below the city's jump in prices, Yee said. 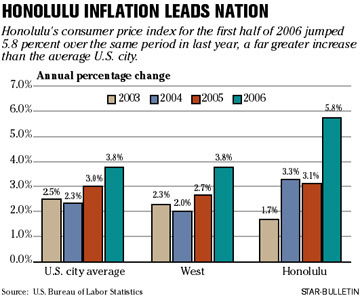 Overall, Honolulu's consumer price index for all urban consumers advanced from 195 during the first half of 2005 to 206.4 during the same period in 2006, according to the federal Bureau of Labor Statistics. Honolulu's high-cost housing contributed most heavily to the increase in its price index, BLS Regional Commissioner Richard Holden said. Honolulu's housing index, which includes such items as rent, fuel, utilities and household furnishings, rose 8.5 percent from the first half of 2005 -- and 3 percent from the previous six months. Honolulu's housing index also experienced the highest 12-month increase since the first half of 1991 -- during the Japanese bubble years -- when the index rose 8.8 percent, he said. Other hot housing markets are feeling similar strains, Yee said. While housing costs account for about 32 percent of inflation nationwide, it plays much more of a role in markets like Honolulu, Miami and Los Angeles where real estate is strong, she said. Housing costs contribute up to 40.5 percent of Miami's CPI and comprise as much as 36.7 percent of Los Angeles' CPI, Yee said. In Honolulu the contribution is 37 percent. "After removing shelter from the basket of goods, Honolulu's rate of increase from the first half 2005 to the first half 2006 was 4.2 percent, less than the national rate of 4.3 percent," Yee said. "Both Miami and Los Angeles were higher at 4.9 percent and 4.6 percent." In Honolulu, housing costs often have been tied to the inflation rate, Imada Iboshi said. Honolulu's CPI was below the national average when the city's real estate market was in a slump, she said. "We have been expecting it to jump for quite some time; however, I think the market is changing and we are at the height of the increase," Imada Iboshi said. Gasoline prices, which rose 24.3 percent from a year earlier and 6.4 percent from the end of 2005, also played a role in Honolulu's inflation rate. High gas prices pushed the broader transportation index in the first half of 2006 up 7.1 percent from the year-ago period. Honolulu's food and beverages prices also rose more quickly than those of the nation as a whole. Food and beverage prices in Honolulu climbed 3.7 percent from the first half of 2005. The cost of eating out increased more than the cost of buying groceries, leading some to speculate that Honolulu's high labor costs are being passed on to consumers. "Restaurants, retail stores and service establishments often have a greater ability to raise their rates to accommodate higher expenses than other businesses," Bishop said. "We've all been feeling that for months." In the past year, a scant decline in education and communication costs was the only price break Hawaii consumers experienced. Education and communication costs fell 1.3 percent from 2005; however, during the past six months they rose by the same amount.